Dr. Neil Hutchison has always valued the importance of exercise and had remained as active as he possibly could, until bouts of arthritis began to affect his knees and feet. About five years ago, he began Nordic Walking, with the hope that this activity would help him remain active, but reduce the load on his joints. 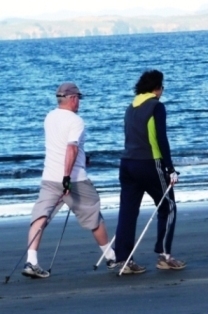 With only minimal instruction, Neil quickly experienced the benefits of Nordic Walking. He was able to maintain a high level of fitness and movement, which was no longer restricted by his arthritis. He was able to continue to enter endurance events, as a Nordic Walker, and has successfully completed 10km and 21 km events. Neil realised that he needed to improve his Nordic Walking technique, with the view of reducing his 10 km time. He contacted June Stevenson (Nordic Kiwi Nordic Walking), an NZ Nordic Walking Coach and registered Exercise Trainer. The one-to-one coaching sessions focussed on technique improvement and general speed. June can customise personal training sessions to suit all fitness levels, and the one-to-one sessions are ideal for people with busy lifestyles or who may have mobility, neurological or rehabilitation conditions. 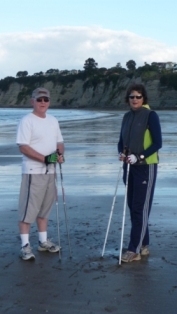 Neil recommends Nordic Walking to his patients and some are now members of the North Shore Nordic Walkers. Nordic Walking is a great social activity, and one of the benefits of Nordic Walking with a group is the motivation, support, friendship and encouragement of your fellow walkers. "Yesterday I was 5th in the Whangamata 10 km walk at 1hr 17 which was about 5 minutes faster than last year, so I was pretty pleased with that. It certainly takes a bit of focus on each of the basics for the whole distance!"